Ah, there’s nothing like looking to a psychic octopus when wanting to see what the future holds. Apparently, this psychic Octopus named Paul has the ability to predict how things are going to turn out, and he uses the simple process of picking one of two mussels that are presented to him. How accurate is Paul? You will need to read on and decide for yourself – I guess I don’t know a whole lot about these creatures, and the whole psychic ability thing is pretty new to me. “Extremely tight – but luckily a win for Germany in the end,” said those in charge of the octopus tank at Aquarium Sea Life in Oberhausen. 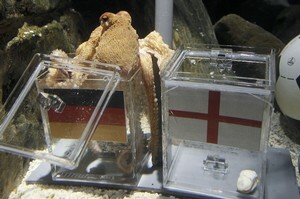 The handlers of the psychic octopus baited glass cubes with mussels marked with both Germany and Argentina. The mussel Paul first chooses is viewed by the handlers as its prediction for the up-coming game. To read more about Paul the psychic octopus, check out the full story here.